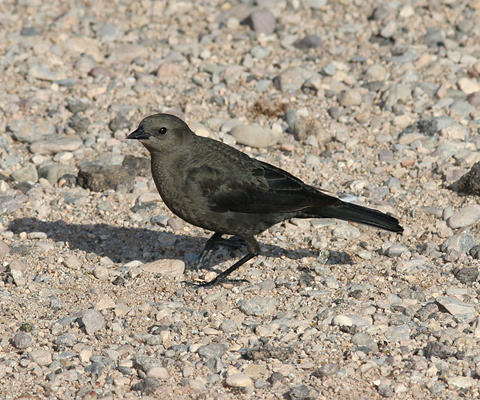 Brewer's Blackbirds (Euphagus cyanocephalus) are common winter visitors here in southern Arizona. 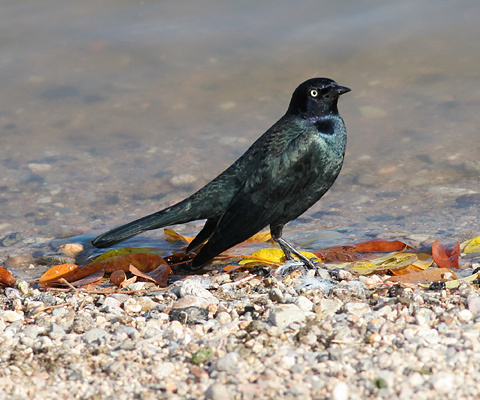 Brewer's Blackbirds prefer open areas, especially those near water, and large flocks of these birds can often be seen foraging on agricultural fields, at livestock feeding sites, and even at city parks and on parking lots. While visiting Lakeside Park here in Tucson in December of 2006, I observed a large flock of Brewer's Blackbirds begging and scavenging for food handouts along with the park's resident ducks. 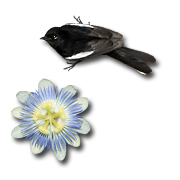 Male Brewer's Blackbirds have white or light yellow eyes and are black with blue-green iridescence on the body and purple iridescence on the head and neck. Female Brewer's Blackbirds are gray-brown and have brown eyes. Although most of the females have dark brown eyes, some of the female Brewer's Blackbirds do have lighter brown eyes. Brewer's Blackbirds have the typical harsh vocalizations of a blackbird, and they are often seen flocking or foraging with other blackbirds. 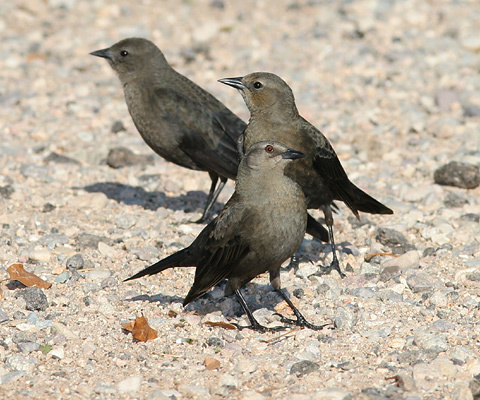 Among these Brewer's Blackbirds were a few Great-tailed Grackles (Quiscalus mexicanus), which were still easy to distinguish due to their larger size despite their rather similar coloration to Brewer's Blackbirds.